My sister and I know the place as Moon Garden but they've changed the name to Lily Pond without any warning. Probably because of the pond that is full of lilies which you cannot miss once inside the premises but that's my guess. 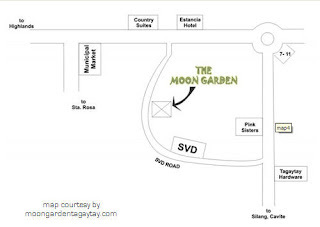 My sister, her fiance and her soon to be SIL (sister-in-law) named Faith were going around in circles trying to look for Moon Garden in SVD road when all along the signage they saw that says Lily Pond is the place. This was the location for my sister's prenuptial shoot which she won in W@W Auction. But I'd rather not talk about the prenuptial shoot at the moment. I'll focus more on the location. Lily Pond is a bed and breakfast just like Sonia's Garden but much cheaper. They don't have bakery or spa like Sonia's but that doesn't mean they don't deserve a visit. I first read about this place in Anton's blog way back in 2008 where it was called Moon Garden Restaurant. For the Prenup Package, it only cost Php 3,000 for half day including free use of a room! Isn't that a good price to pay for a shoot? No wonder my sister decided to book this place last March 12. These are the accounts of info I'd gather from Faith since I'm not with them during this time. It's actually a bummer as I would love to see the place and it's an excuse for me to go out of town. My sister's offer is quite tempting to join them but the "responsible employee" in me prevails. According to Faith, the room(casita) is made of stones especially on the walls and flooring while big logs served as a divider for the bed & bathroom/restroom. The room has a ceiling made of bamboo and a big screened window served as the source of air which means it's not air-conditioned. I like the look of the bathroom! Walls and floors made of stones plus some wood side table, shelf and a plank of wood to support the lavatory with modern fixtures. This kind of setup reminded me of a bathroom for a resort! Okay, enough of my babbling and I'm going to post some pics of what I've missed. Let these fine scenery do the talking. Can you picture yourself having a candle lit dinner in that cottage? Sigh. The greens reminds me of my father's province which is Bicol. They have a lot of trees and veggies in the backyard when I last went there (2003). Can you spot the smiley faces? If you noticed, majority of things are vintage with a mix of modern furnishings/accessories like couch, throw pillows, paintings, etc. Faith (SIL) was not able to check out the other spots in Lily Pond since the photographers of the photo shoot are looking for a certain place where they have a good natural light for the shots they want to achieve. Every once in awhile, we city people need a breather from the hectic and fast-paced life we are living in the urban jungle so why not have a relaxing day or two and spend it here. I come across Half White Boy's blog entry about this place so you might want to check this out for his review is fresh after availing their overnight accommodation last month. Plus, he has more pictures to share compared to mine. For more reviews, check Trip Advisor.